If your car’s damage is severe, then windscreen replacement may be the only course of action. However, when the crack or chip is more moderate, then windscreen repair is a viable option. Visit our workshop, in Stoke-on-Trent, Staffordshire, to speak to an expert about your next steps. At Autoshield Windscreens (Nationwide) Ltd, we do everything possible to ensure that you’re given great service every time. To ensure safety, your windscreen must be maintained and in good condition. Cracks and other damage may weaken the strength of the windscreen or affect vision through the glass. Major damage may require a windscreen replacement, but minor damage means that a repair is more feasible. We’re normally able to repair a chipped windscreen for free, subject to insurance cover. Some excess may apply to this service. Most cars on the road today have windscreens made from laminated glass. This is a sandwich of two pieces of glass, with a plastic interlayer in-between. While the outer layer of this laminate may crack, much of the glass remains intact, assuming that the accident isn’t too severe. The British Standard Code of Practice, BS AU 242A 1998, sets out guidelines for when windscreens may be repaired and when they may not. 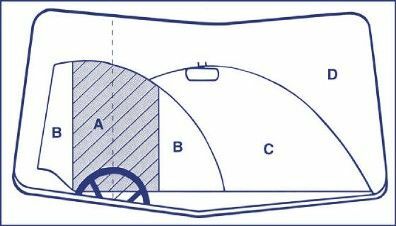 Within Zones B, C, and D, no two repaired areas should be closer to each other than 100mm. Contact us, in Stoke-on-Trent, Staffordshire, to find out more about our windscreen repair and replacement.